We are leading Manufacturer of Clean Room Indicator - Hawkeye RTC and our product is made up of good quality. 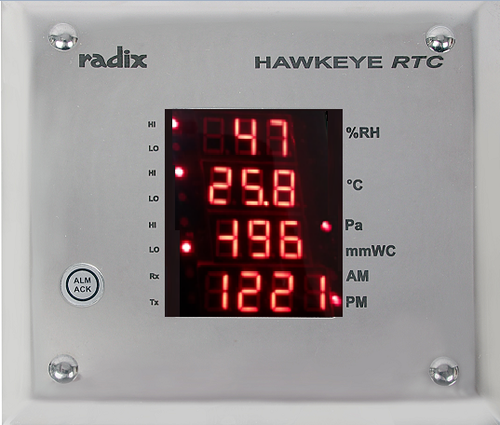 The Clean Room Monitor Hawkeye RTC from RADIX offers a state-of-the-art technology solution for Relative Humidity, Temperature and Differential Pressure indication for Clean Rooms. RS485/MODBUS RTU multi-drop communication for PLC, SCADA, etc. Established in 1980, Radix Electrosystems Private Limited is a leading firm engaged in the manufacture, supply and export of a complete range of Process Instrumentation products such as Temperature Calibrator, Thermocouple Calibrator, PID Controllers, Industrial Automation Systems, Level Sensors, Flow sensors, Process Automation Transducers, Building Automation Systems, Automation System Integrators, HVAC Control System, Voltage Transducer, Power Transducer and Current Transducer. Our products are widely used in pharmaceutical, steel, chemical, food and beverages, auto-mobile, packaging and agriculture industries. Manufactured using technology developed by our design and development department, these products are rigorously tested for quality. This range of products conforms to relevant global norms and standards. Our avant-garde research and manufacturing facilities result in cutting-edge and top quality products. Understanding individual needs, Radix offers customized products and solutions for virtually any application. Our process of ongoing improvement assures our customers of the latest technology and reducing prices. We hand-pick our staff to have the finest expertise in our industry backed by conscientious customer support. Our organization has been a part of prestigious trade shows and events such as Elecrama, Chem tech, Automations, ISA and Hanover, among others. We have mustered a huge client base across the markets of Middle East, Egypt, Africa & Germany.